86/159 David Mumpower I am assured this is not an inferior re-make of either Antz or A Bug's Life, but that's my story and I'm sticking to it. 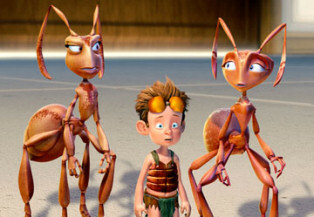 This CGI-animated film is based on the illustrated children's book by John Nickle, and like Antz and A Bug's Life before it, takes place in the whimsical world of bugs. The movie is directed by John A. Davis, who previously created a surprise success in Jimmy Neutron: Boy Genius, and features a stellar voice cast. Such names as Nicolas Cage, Julia Roberts, Meryl Streep, Paul Giamatti and Lily Tomlin will be featured. The story starts out showing us a young boy named Lucas, who wears a doofy propeller cap and nerdy glasses. Since he's a bit of an oddball, he naturally is the victim of a bully named Sid. When Sid blasts Lucas with a water hose, Lucas has his revenge by doing the same thing to a colony of ants. As it happens, these ants are vengeful, and use a magical potion to reduce him to their size. See the latest developments for this project on the The Ant Bully Movie News page.